In 1995, the U.S. Geological Survey (USGS) made the first systematic assessment of the in-place natural gas hydrate resources in the United States. That study suggested that the amount of gas in the nations hydrate accumulations greatly exceeds the volume of known conventional domestic gas resources. With higher natural gas prices and forecasts of tight supply, new projects are pushing forward to better understand the geologic, engineering and economic factors controlling the ultimate energy resource potential of gas hydrates. However, gas hydrates still present both scientific and technological challenges in turning them from nonproducible accumulations of gas to a useable resource. Research coring and seismic programs carried out by the Ocean Drilling Program, government agencies and several industry consortia have significantly improved our understanding of how gas hydrates occur in nature and have verified the existence of highly concentrated gas hydrate accumulations at several locations. Hydrates are found widely dispersed in permafrost regions and beneath the sea in sediments of outer continental margins (see sidebar). At the Mallik site in Canadas Mackenzie Delta, researchers undertook the first modern, fully integrated field study to test the production potential of natural gas hydrates  an ice-like solid mixture of methane gas and water located beneath the permafrost, which some say could represent a new energy source. Image courtesy of the Mallik 2002 Project. The estimated amount of natural gas contained in the worlds gas hydrate accumulations is enormous, but is speculative and ranges over three orders of magnitude, from about 2,800 to 8,000,000 trillion cubic meters of gas. Alexei Milkov recently reported in Geology that the volume of gas trapped globally in gas hydrate accumulations is in the range of 3,000 to 5,000 trillion cubic meters of gas, which is four to seven times less than some of the more widely cited estimates (see sidebar). By comparison, conventional natural gas accumulations (reserves and technically recoverable undiscovered resources) for the world are estimated at approximately 440 trillion cubic meters, as reported in the U.S. Geological Survey World Petroleum Assessment 2000. Despite the enormous range in reported gas hydrate volumetric estimates, even the lowest estimates seem to indicate that gas hydrates are a much greater resource of natural gas than conventional accumulations. It is important to note, however, that none of these assessments have predicted how much gas could actually be produced from the worlds gas hydrate accumulations. Much more work is needed to go beyond these in-place gas hydrate volumetric estimates to assess the hydrates as an energy resource. Gas recovery from hydrates is challenging because the gas is in a solid form, and because hydrates are widely dispersed in hostile Arctic and deep marine environments. Similar to conventional hydrocarbon production, the first recovery of hydrate resources will occur in areas with the greatest concentration. Proposed methods of gas recovery from hydrates generally deal with disassociating or melting in-situ gas hydrates, by heating the reservoir beyond the temperature of hydrate formation or decreasing the reservoir pressure below hydrate equilibrium. Depressurization is considered to be the most economically promising method for the production of natural gas from gas hydrates. The Messoyakha gas field in northern Russia is commonly used as an example of a hydrocarbon accumulation from which gas has been produced from hydrates by simple reservoir depressurization. The field was developed for conventional gas, and scientists have long thought that the sustained gas production was due to the contribution of gas from gas hydrate into an underlying free-gas accumulation. The production history of the Messoyakha field possibly demonstrates that gas hydrates are an immediately producible source of natural gas and that production can be started and maintained by conventional methods. The pace of projects to assess gas hydrate energy potential has accelerated over the past several years because of the realization that this unconventional resource could be developed in conjunction with conventional gas fields. The most significant development was gas hydrate production testing conducted at the Mallik site in Canadas Mackenzie Delta in 2002. The Mallik International Consortium is an international team, involving Japan, Canada, the United States, India and Germany, as well as the International Continental Scientific Drilling Program. Last December, the partners in the Mallik 2002 Gas Hydrate Production Research Well Program publicly released the results of the first modern, fully integrated field study and production test of a natural gas hydrate accumulation  allowing for the rational assessment of the production response of a gas hydrate accumulation. Computer production simulations supported by the project, including those performed by Lawrence Berkeley National Laboratory, have shown that under certain geologic conditions, gas can be produced from gas hydrates at very high rates, exceeding several million cubic feet of gas per day. Extraordinary technological developments in the petroleum industry  3-D seismic techniques, secondary recovery methods and horizontal drilling, for example  have allowed the extraction of resources once thought to be unavailable. Researchers often compare hydrates to coalbed gas resources, which were also considered to be an unconventional and uneconomic resource in the not-too-distant past. However, once geologists understood the resource, defined the reservoir properties and addressed the production challenges, coalbed gas became an important part of the nations energy mix. Now, coalbed gas is a viable fuel in its own right and accounts for almost 10 percent of the natural gas production in this country. Natural gas hydrates also may become economically extractable. Past experience with the development of other unconventional energy resources clearly shows that the evolution of gas hydrate into a producible source of energy will require a significant and sustained research and development effort. That effort has begun in the United States with the Methane Hydrate Research and Development Act of 2000, which authorizes the expenditure of $43 million over five years and directs the U.S. Department of Energy (DOE), in consultation with USGS, the Minerals Management Service, the National Science Foundation, the Department of Defense and the Department of Commerce, to commence basic and applied research to identify, explore, assess and develop methane hydrates as a source of energy. Onshore Alaska and the offshore Gulf of Mexico are proven exploration targets for gas hydrates (see sidebar). There, critical drilling and transportation infrastructure exists that will allow gas hydrate prospects to be drilled and produced from existing installations. In the Gulf of Mexico, industry has begun characterizing hydrates on their oil and gas leases. And industry-government partnerships are expected to drill hydrate prospects on the North Slope of Alaska in the near future. Hence, the first domestic production of hydrates may occur in Alaska, where gas from onshore hydrates will either support local oil and gas field operations, or be available for commercial sale, if and when a gas pipeline is constructed. Many countries other than the United States are also interested in the energy resource potential of gas hydrates. Japan, Canada, India and others have established large gas hydrate research and development projects, while China, Korea, Norway, Mexico and others are investigating the viability of forming government-sponsored gas hydrate research projects. In 1995, the government of Japan established the first large-scale national gas hydrate research program, which now plays a leading role in worldwide gas hydrate research efforts. Plans for 2004 included drilling and coring between 10 and 20 wells in the Nankai Trough off Japans east coast, where gas hydrates were recovered during previous field studies in 2000. Japan has budgeted more than $65 million (US) for this years gas hydrate studies. Indias government is also funding a large national gas hydrate program to meet its growing gas requirements. Seismic data have been acquired on the Indian continental margin, and current plans call for drilling and coring dedicated gas hydrate wells in 2005. In addition, gas hydrates were recently discovered during drilling for conventional oil and gas resources in the Krishna-Godavari Basin along the eastern coast of India. Despite all the projects and timelines, however, the actual timing for expected commercial production of hydrates remains uncertain. DOE has estimated that gas production from gas hydrates could begin around 2015. In September 2003, the National Petroleum Council reported that we are not likely to see significant production from gas hydrates until sometime beyond 2025. However, initial production from gas hydrates will most likely occur much sooner, especially in areas such as the North Slope of Alaska and Canada. While estimates vary on when (and if) gas hydrate production will play a significant role in the total world energy mix, it is possible that hydrates will be able to provide a sustainable supply of gas for the worlds future energy needs. Although individual gas hydrate researchers often focus on issues ranging from gas hydrates as a potential energy resource to a potential geologic hazard, or as a possible agent of global climate change, all of these efforts are fundamentally linked under our need to understand the geologic controls on these accumulations in nature. Under the Methane Hydrate Research and Development Act of 2000, the U.S. Department of Energy (DOE) funds laboratory and field research on both Arctic and marine gas hydrates. Among its current Arctic studies is a three-year program sponsored by Maurer Technology and Anadarko Petroleum Corporation. 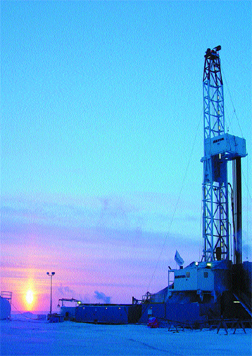 Anadarko spudded the Hot Ice 1 well on the North Slope of Alaska in March 2003 and completed it last February. Hot Ice 1 was designed to validate geological, geophysical and geochemical models of onshore Arctic gas hydrate occurrences. 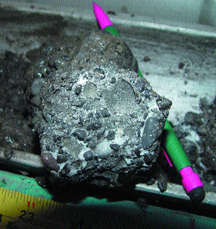 In this gas-hydrate-bearing rock core collected from a well at the Mallik site in Canada, the gas hydrate is the white material filling the void spaces in the conglomerate. Image courtesy of the Mallik 2002 Project. Additionally, DOE and BP Exploration Alaska have undertaken a project to characterize, quantify and determine the commercial viability of onshore gas hydrates and associated free-gas resources in the Prudhoe Bay, Kuparuk River and Milne Point field areas in northern Alaska. The University of Alaska in Fairbanks, the University of Arizona in Tucson and the U.S. Geological Survey (USGS) are also participating in the Alaska British Petroleum project. Under Phase 1 of this project, the objective is to characterize reservoirs and fluids, leading to estimates of the recoverable reserve and commercial potential and to procedures for gas hydrate drilling, data acquisition, completion and production. Phases 2 and 3 of this Alaska effort will integrate well, core, log and production test data from additional test wells. Ultimately, the program could lead to development of a gas hydrate pilot project in the Milne Point area, and the determination of whether gas hydrates can become a part of the Alaska North Slope gas resource portfolio. Beyond the studies with DOE and BP, USGS is also working with the Bureau of Land Management and the Alaska Division of Geological and Geophysical Surveys, to assess the resource potential of other selected gas hydrate and free-gas accumulations on public lands in northern Alaska. Researchers will then use information from this study to assess and characterize the gas hydrate potential in the National Petroleum Reserve-Alaska, Arctic National Wildlife Refuge and state lands. The goal of this joint work is to assess the economically recoverable resource potential of gas hydrates and associated free-gas accumulations across the entire North Slope of Alaska by 2007. Several Gulf of Mexico gas hydrate research programs are also in progress. The most comprehensive study is a joint industry project led by ChevronTexaco and DOE that is designed to further characterize gas hydrates in the Gulf of Mexico. The joint project is planning to drill and core multiple Gulf of Mexico sites in the spring of 2005. While the primary goal of the Gulf of Mexico Joint Industry Project is to better understand the safety issues related to gas hydrates, the results of the program will also allow a better assessment of the commercial potential of marine gas hydrates. In anticipation of gas hydrate production in federal waters, the Minerals Management Service has launched a project to assess gas hydrate energy resource potential on acreage under its jurisdiction. The agency must update its resource assessment models to include gas hydrates, as fair market value must be determined for offshore tracts to be offered in the next Five-Year Oil and Gas Leasing Program. An effort is under way using seismic data, existing core holes, shallow well logs, temperature data, gas compositions, and sediment thickness over salt to delineate and estimate the areas in the Gulf of Mexico that are likely to contain gas hydrates. Despite the fact that relatively little is known for certain about the ultimate resource potential of gas hydrates, these ongoing hydrate research programs, along with others throughout the world, will significantly contribute to our understanding of the technical challenges that must be overcome to turn this potentially enormous storehouse of gas into a producible energy resource. Collett has been a research geologist with the U.S. Geological Survey for the past 20 years. E-mail: tcollett@usgs.gov. Ahlbrandt, T.S., 2002, Future petroleum energy resources of the world: International Geology Review, v. 44, p. 1092-1104. Collett, T.S., 1993, Natural gas hydrates of the Prudhoe Bay and Kuparuk River area, North Slope, Alaska: American Association of Petroleum Geologist Bulletin, v. 77, no. 5, p. 793-812. Collett, T.S., 1995, Gas hydrate resources of the United States, in Gautier, D.L., et al., eds., 1995 National assessment of United States oil and gas resources on CD-ROM: U.S. Geological Survey Digital Data Series 30. Collett, T.S., 2002, Energy resource potential of natural gas hydrates: American Association of Petroleum Geologists Bulletin, v. 86, no. 11, p. 1971-1992. Milkov, A.V., Claypool, G.E., Lee, Y-J., Xu, W., Dickens, G.R., Borowski, W.S., and the Ocean Drilling Program Leg 204 Scientific Party, 2003, In situ methane concentrations at Hydrate Ridge, offshore Oregon: New constraints on the global gas hydrate inventory from active margins: Geology, v. 31, no. 10, p. 833-836.